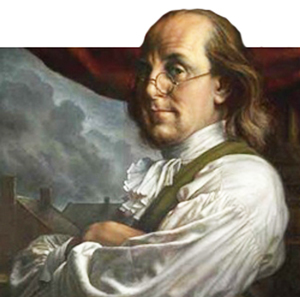 Franklin’s optimism was so irrepressible that he left 200-year endowments to Boston and Philadelphia. In 1785 a French mathematician named Charles Joseph Mathon de la Cour wrote a parody of Benjamin Franklin’s Poor Richard’s Almanac in which he mocked the unbearable spirit of American optimism represented by Franklin. The Frenchman fictionalized about “Fortunate Richard” leaving a small sum of money in his will to be used only after it had collected interest for 500 years. Franklin, who was seventy-nine years old at the time, wrote back to de la Cour, thanking him for the great idea and telling him that he had decided to leave a bequest to his native Boston and his adopted Philadelphia of 1,000 pounds to each, on the condition that it be placed in a fund that would gather interest and support the public good for the succeeding 200 years. De la Cour wrote a parody of Benjamin Franklin’s Poor Richard’s Almanac in which he mocked the unbearable spirit of American optimism represented by Franklin. Notwithstanding the perils that lay ahead, Franklin’s irrepressible optimism enable him to see past the innumerable needs of the moment and uncertainty of the future. Two years later in 1789 he wrote a codicil to his will that provided funds to establish the 200-year endowment. People with a fearful, pessimistic view of the future are never going to fund multigenerational or perpetual endowments. Neither will those who think the world is destined to get worse and worse. They may be the kindest and most generous souls on earth, but they are not endowment makers. For social, political, and/or religious reasons, it fundamentally goes against the way they see the world. They may be the kindest and most generous souls on earth, but they are not endowment makers. Great institutions are built by visionaries — optimistic leaders and supporters who are certainly aware of the ills and evils of society but choose to focus their attention on the preferred future. They look ahead, visualize what could be done and employ their resources accordingly. Those are the kind of forward-thinking optimists that endeavor to secure and stabilize the future through endowments. Those are the donor relationships we want to cultivate. Conversely, fundraisers who regularly play the crisis card to motive their donors to give are in effect diminishing the possibility of a gift to the endowment. They plant a pessimistic seed in the donor’s mind suggesting that the organization will not survive. They plant a pessimistic seed in the donor’s mind suggesting that the organization will not survive. In 1894, at the end of the first 100 years, the Boston fund had been used as instructed and had grown to 131,000 pounds ($391,000). In the following century the bulk of the proceeds were used to fund public works in Boston. In 1905, $322,490 was used to establish the Franklin Union, a technical school. The remainder of the funds continued to be loaned out for apprentice programs and scholarships. In 1990, the end of the second century, Franklin’s Boston endowment was worth more than $5,000,000 and the Philadelphia fund about half that. In both cities Franklin’s endowment has been used to help thousands of young people and has served as an enduring testament to philanthropy and community service. In May 2005, a group of exceptionally creative young people selected from all over the nation gathered at the Smithsonian Institute in Washington D.C. for an award ceremony. They were the latest recipients of the Franklin Legacy Prize medals. Franklin’s 1789 codicil made provisions for awards to be given annually to outstanding young students, providing silver medals that have been awarded each year since 1793. Wish of benjamin franklin is so much praiseworthy.